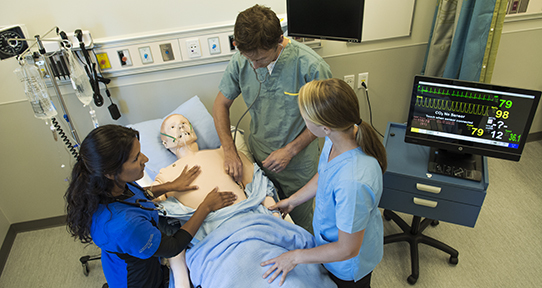 Our students get hands-on experiences in nursing care, in part because of our collaborative partnerships at the Centre for Interprofessional Clinical Simulation Learning. We offer the final continuous terms of third and fourth year of the Bachelor of Science in Nursing program on-campus for students continuing from college partner sites Aurora College, Camosun College, College of the Rockies and Selkirk College. Students admitted into the BSN Program at Camosun College start the program at Camosun College and continue to UVic to study the final continuous terms of third and fourth year on the UVic campus. Students will spend 2.5 years at Camosun College, which includes 5 academic semesters and 2 spring practicum terms. They will then move to the University of Victoria to finish up the final 2 semesters and consolidated practice experiences, which takes a total of 1.5 years. Students may be eligible for entrance scholarships to UVic at this time. Students who start the program at Aurora College, Selkirk College or College of the Rockies become UVic students and take the final continuous terms of third and fourth year UVic courses at their respective college campuses.